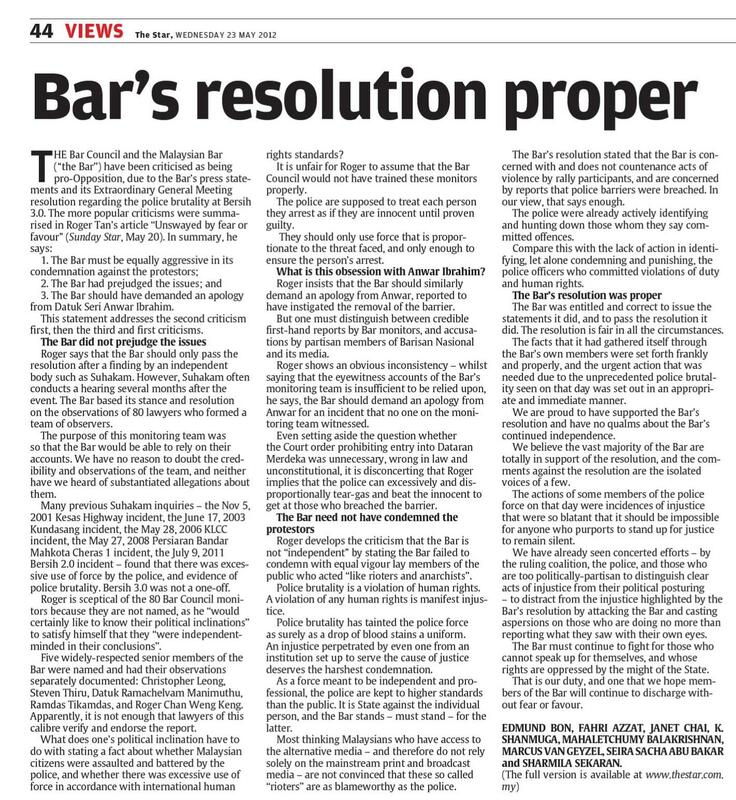 MAY 22 — The Bar Council and the Malaysian Bar (“the Bar”) have been criticised recently as being pro-opposition. This is because of the Bar’s press statements and its extraordinary general meeting resolution regarding the police brutality shown at the Bersih 3.0 sit-down rally. The common theme adopted by critics of the Bar is that the Bar was not fair, or even-handed, as the Bar were more critical of the police than it was of the other parties involved. 1. The Bar in condemning the police brutality must be equally aggressive in its condemnation against the protestors who “behaved like rioters and anarchists”. 2. 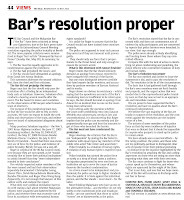 The Bar had prejudged the issues by passing the resolution because by doing so “the Bar had already come to a conclusion that all those acts listed therein had been committed by the police”. 3. The Bar should have demanded an apology from Datuk Seri Anwar Ibrahim because “it was his men who were reportedly the ones who removed the barrier” which was “the trigger point”. Most importantly, many previous Suhakam inquiries — the November 5, 2001 Kesas Highway Incident, the June 17, 2003 Kundasang Incident, the May 28, 2006 KLCC Incident, the May 27, 2008 Persiaran Bandar Mahkota Cheras 1 Incident, the July 9, 2011 Bersih 2.0 Incident — found that there was excessive use of force by the police, and evidence of police brutality. Numerous complaints by victims led to the said inquiries, the findings of which thereafter vindicated the complaints leading to damning conclusions about police conduct. These many reports do not just show isolated instances of police brutality: Bersih 3.0 was not a one-off. There is a pattern of regular use of excessive force and brutality in violation of human rights by the Royal Malaysian Police Force. Despite these many reports by Suhakam, and despite the findings of the Royal Commission to Enhance the Operation and Management of the Royal Malaysia Police, the police have not made any serious attempts to school themselves in the prevention of human rights violations. Regrettably, Roger is sceptical of the 80 monitors appointed by the Bar Council because they are not named, as he “would certainly like to know their political inclinations” to satisfy himself that they “were independent-minded in their conclusions”. Firstly, five widely-respected senior members of the Bar, who were a part of a “roving” team of monitors, were named and had their observations separately documented: Christopher Leong (vice-president of the Malaysian Bar), Steven Thiru (treasurer of the Bar Council), Datuk Ramachelvam Manimuthu, Ramdas Tikamdas, and Roger Chan Weng Keng. Apparently it is not enough that lawyers of this calibre verify and endorse the report. Rather conveniently, whilst casting these aspersions on others, Roger himself does not reveal his strong affiliations to a particular political party. Employing Roger’s logic, one wonders, perhaps, whether commentators in The Star, for example, should also be required to divulge their political affiliations and leanings before their opinion pieces are published. But we will not venture into the realm of the fallacy of argumentum ad hominem to discredit the views of others, as Roger disappointingly has. In his third criticism, Roger insists that the Bar should similarly demand an apology from Anwar because he was reported to have instigated the removal of the barrier. But Roger must understand that one must distinguish between credible first-hand reports by Bar monitors, and accusations by obviously partisan members of Barisan Nasional and its media. This is where Roger shows an obvious inconsistency — whilst saying that the eyewitness accounts of the Bar’s monitoring team are insufficient to be relied upon, he says that the Bar should demand an apology from Anwar for an incident that no one on the Bar’s monitoring team witnessed. Despite the many eyewitness blog entries, photos and videos, there has been no compelling evidence either way to show who removed the barriers, or whether their removal was facilitated by the police, public or opposition members. On what basis is Roger suggesting that the Bar demand an apology from Anwar? Police brutality is a violation of a human right. A violation of any human right is manifest injustice. Police brutality per se is an injustice. The presence of police brutality has tainted the Royal Malaysian Police as surely as a drop of blood stains a uniform. An injustice perpetrated by even one from an institution set up to serve the cause of justice deserves the harshest condemnation. There cannot be any restraint in condemning abuse of power. As a police force meant to be independent and professional, the Royal Malaysian Police are kept to higher standards than lay members of the public. So the Bar cannot be swayed by fear or favour; it cannot be hesitant or even handed in condemning an injustice that is police brutality. Here is an Executive institution that is well-funded and well-staffed with wide powers taking action against unarmed people. It is state against the individual person, and the Bar stands — must stand — for the latter. There is one further reason why we would not have voted for a resolution that condemned those members of the public who turned violent. The fact is that most thinking Malaysians who have access to the alternative media — and therefore do not rely solely on the bare-faced propaganda of our mainstream print and broadcast media — are not convinced that these so-called “rioters” are as blameworthy as the police. The police put razor wire across our city roads, turning Kuala Lumpur into a war zone before any violence had ensued. The police obtained a totally unnecessary court order prohibiting entry for four days into Dataran Merdeka, without any notice or opportunity to the organisers of Bersih 3.0 to present their case despite ample time for them to do this. Then, when the disturbance started, it was the police who shot tear gas behind and in front of retreating protestors so that they were boxed in rather than allowed to disperse. Who ordered the closure of the nearby LRT stations so as to prevent people from dispersing? Who ordered the destruction of cameras belonging to journalists, and the reported censorship of Al Jazeera and the BBC? What justified the four hours of continued attacks on people who were already dispersing or having dinner? All this done against fellow Malaysians, who until the very end had taken part in an almost perfect rally. It is telling that Roger states that “removing the barrier was the trigger point” and adds that it is “common sense” that “whoever first raises his hand against the other is the most blameworthy”. Words do not suffice to describe the disingenuous nature of the suggestion that the removal of the barrier is even remotely comparable to the brutal actions of the police. In any case, there have been no reports of barriers being “breached” in front of the Bar Council, on Leboh Pasar Besar — yet even then, water cannons and tear gas were fired there. Roger fails to acknowledge the clear reality that police reaction was not localised to Dataran Merdeka or to the participants there, and that other than at the Jalan Raja/Tun Perak junction, it was the police who struck first. The actions of some members of the police force on that day were incidences of injustice that were so blatant that it should be impossible for anyone who purports to stand up for justice to remain silent. We have already seen concerted efforts — by the ruling coalition, the police, and those who are too politically partisan to distinguish clear acts of injustice from their political posturing — to distract from the injustice highlighted by the Bar’s resolution by attacking the Bar and casting aspersions on those who are doing no more than reporting what they saw with their own eyes. * This response is jointly endorsed by Edmund Bon, Fahri Azzat, Janet Chai, K Shanmuga, Mahaletchumy Balakrishnan, Marcus van Geyzel, Seira Sacha Abu Bakar, and Sharmila Sekaran.